Our supplier of disposables and food packaging Huhtamaki recently presented at the Simply Cups Conference where Clare Moulson, Marketing Executive Huhtamaki UK, talked about some of collaborative cup recycling projects Huhtamaki has led with Simply Cups and in partnership with Local Authorities, businesses and operators. Clare Moulson had the following to say: “In February 2018, we launched a new recycling initiative for paper cups in Gosport – the first of its kind in the UK. This is a collaborative approach between Huhtamaki UK, Simply Cups and Gosport Borough Council, to prove that PE coated paper cups can be recycled and demonstrate how a partnerships can work to provide a long-term industry approach to engage operators and consumers and to further drive change in the UK”. 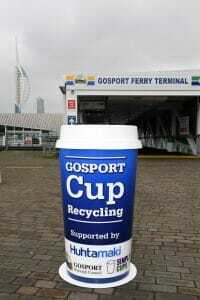 The Gosport Cup Recycling scheme was launched to trial an accessible recycling infrastructure in the Borough of Gosport (Hampshire), to enable consumers and residents the opportunity to dispose of used paper coffee cups responsibly, so they are sent for recycling in the UK. The aim of the project was to prove that paper cups can be recycled, increase cup recycling in the area and to act as a catalyst for other Councils, businesses or venues to collect and recycle used paper cups. 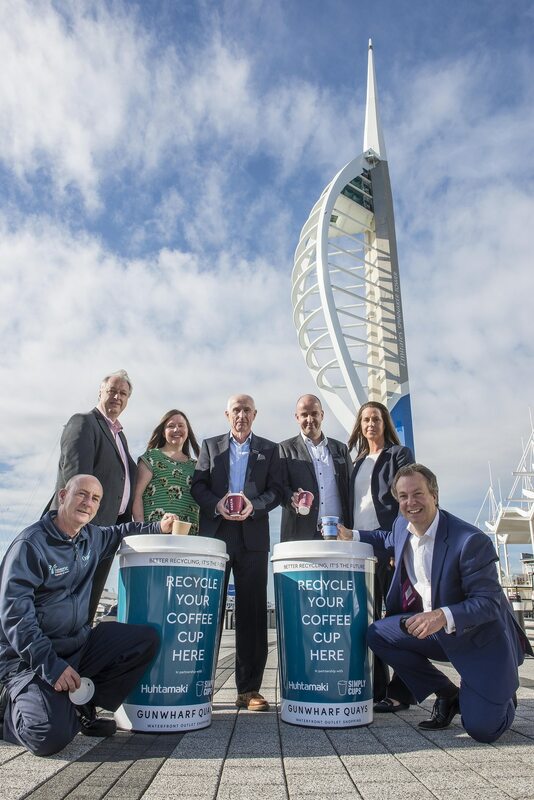 In October 2018, in partnership with Landsec and Simply Cups, Huhtamaki launched paper cup recycling at the Gunwharf Quays shopping outlet in Portsmouth (Hampshire). Initially 10 cups shaped bins have been located around the shopping and waterfront areas so that used paper cups can be collected and sent for recycling. This is a fantastic new recycling scheme which started because the Gunwharf Quays team had seen the cup recycling bins in Gosport. 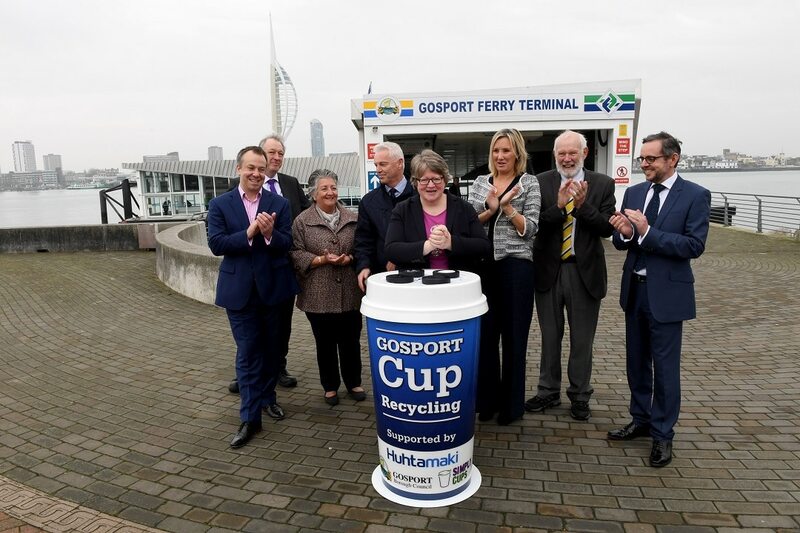 In response to the Gosport Cup Recycling scheme and Gunwharf Quays launching cup recycling, Huhtamaki have launched the ‘Solent Cup Recycling Project’ in conjunction with Simply Cups, Bettavend, Gosport Borough Council and Portsmouth City Council. The aim of the Solent Cup Recycling Project is to further increase the number of businesses locally in the Solent region who collect paper cups for recycling and therefore continuing to increase the number of cups that are being recycled. These projects have resulted in a dedicated paper cup collection service running in the area, increased consumer and operator engagement and the momentum required to further accelerate cup recycling. All of which reinforces the messaging that paper cups are recyclable and continues to lead to a large amount of public and private sector enquiries into recycling paper cups.